Pete Bradbury spent a lifetime in business, sales and marketing and has worked for several major international companies including Toshiba, GE and Ericsson. He started a successful guitar import business in 2002 before more recently devoting himself full time to local politics and charity work. Pete has been on the governing bodies of several local schools including Bolnore Village, where he was one of the founders, and St Marks, Staplefield. As Chairman of Standards at Warden Park, he oversaw a substantial increase in pass rates and is the founder and Chairman of Mid Sussex Science Week, which inspires primary children in the STEM subjects - science, technology, engineering and maths. Pete is Chairman of the national charity Building Heroes, which helps armed service leavers and veterans into employment in the building trades. 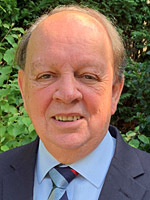 He is a Trustee of the Sussex Learning Trust and represents Cuckfield on Mid Sussex District Council. He is former Chairman of Ansty & Staplefield Parish Council. Pete is a native of Lancashire but has lived in Sussex since 1977. He is a self-taught guitarist, a keen cricketer and former Chairman of Staplefield Cricket Club where he has played since 1985. He is a great believer in promoting sports for all ages particularly for the young and he wants to improve sports and leisure facilities for the use of all members of the community.